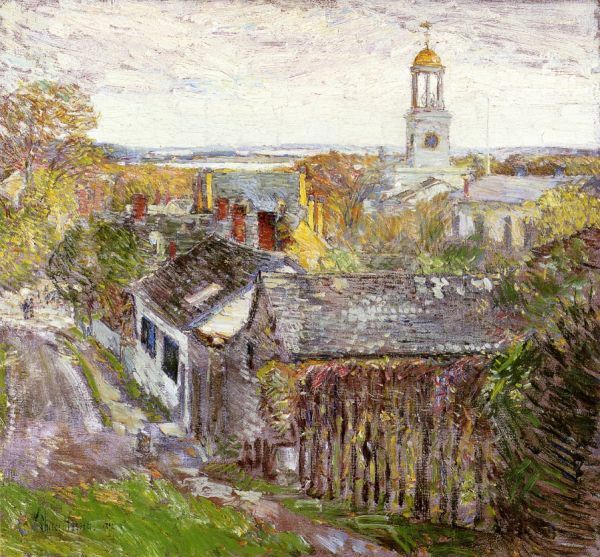 Painting by Frederick Childe Hassam (1859-1935). A highly prolific artist who painted recognizable but stylized views of scenes in many countries. His subject matter covered a wide range, from monumental to mundane; the seasons depicted were from blush of spring to harsh winter winds; pure nature scenes and the most urban location were near equally represented in his extensive output. Surveying his work as a whole shows him to have a wide interest and curiosity, as well as a generous sense for where beauty is found, and recognizing that attitude enlivens the appreciation of each of his works.